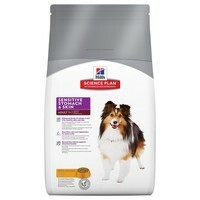 Hills Science Plan Sensitive Stomach & Skin Dry Food for Adult Dogs has been designed especially for dogs who enjoy their food, but sometimes suffer stomach upsets. This food is nutritionally balanced but also contains high quality, easily digestible carbohydrates (including rice) to be gentle on the dog's stomach. In addition, Hills Science Plan Canine Sensitive Stomach Adult contains a unique blend of natural fibre to further assist digestion and Hill's Superior Antioxidant Formula to support the immune system. Ideal for dogs between one and six years old. Full of high quality, easily digestible carbohydrates and a unique blend of natural fibre. Contains Hills Superior Antioxidant Formula.